Increase your phone's security by setting up a screen lock. 1 From the Home screen, swipe up or down to access the Apps screen. 3 Touch Lock screen and security. • Swipe: Swipe the screen to unlock it. • Pattern: Create a pattern that you draw on the screen to unlock. • PIN: Select a PIN to unlock the screen. • Password: Create a password for unlocking the screen. • None: No screen lock. • Face: Use facial recognition to unlock. • Fingerprints: Use fingerprint recognition to unlock the screen. 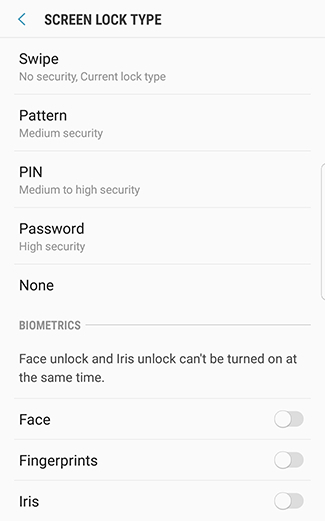 • Iris: Use iris recognition to unlock the screen. We recommend the usage of iris recognition as it provides the highest level of security. Make sure your device is connected to a Samsung account before setting up a screen lock. Don’t forget your credentials to your Samsung account, or your PIN, pattern, or password. Write them down on paper or in electronic form, if necessary. You may lose access to the data stored on your device if you don’t respect those security rules. Remember that it is not mandatory to set a screen lock to use your smartphone. 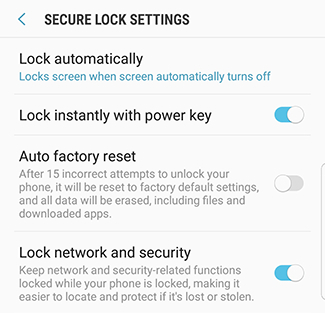 Secure lock settings are only available when a screen lock is set. 4 Touch Secure lock settings. • Lock automatically: Choose when your phone will lock the screen after the display turns off automatically. • Lock instantly with power key: Set your phone to lock instantly when you press the power key. • Auto factory reset: After 15 incorrect attempts to unlock your phone, it will be reset to factory default settings, and all data will be erased, including files and downloaded apps. • Lock network and security: Keep network and security-related functions locked while your phone is locked, making it easier to locate and protect if it’s lost or stolen. How do I set up my Galaxy Note8 to use fingerprint security? How do I set up my Galaxy Note8 to use facial recognition security?